I am starting ‘Six Word Saturday’ on my blog again. Mainly because I miss doing it and also to help me fully participate in National Blog Post Month. I did NaBloPoMo last year and I really felt like I had achieved something by the end of it. This month will consist of the regular posts I do, like ‘Through The Lens Thursday’ and ‘Weekly Photos’ as well as more ‘What I am Wearing’ and CatsEatDogs jewelry posts. I wonder what else I will be writing about? I think I will see how the month takes me and maybe we can have lots of chats in the comments! 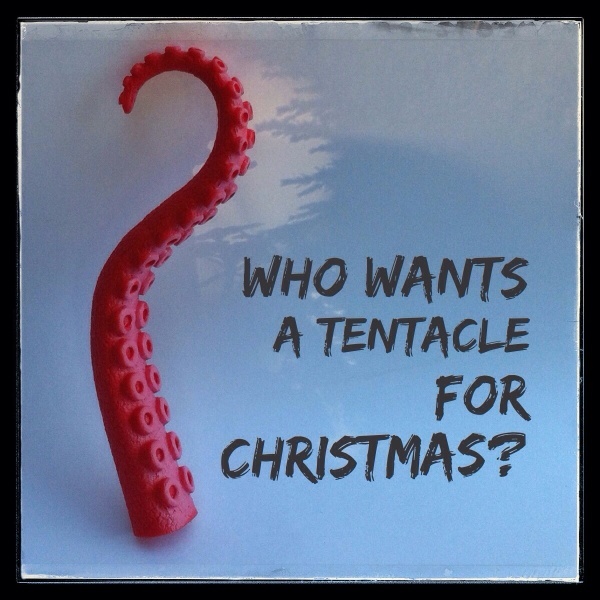 In case you are wondering, the tentacle is part of a Christmas present for my cousin’s 13 year old son! Have you started Christmas shopping yet? I like to get an early start as I have to mail lots abroad and it can take a while to get there. All of the Six Word Saturday posts will go on Instagram too, so come and join in if you want! I use the hashtag #sixwordsaturday and I am @catseatdogsmakes on Insta. Looking forward to seeing all of your NaBloPoMo Posts! I know what you mean Karen, I have bought a bargain in September before and nearly bought it again because I had forgotten I even had it! I write everything down that I have bought which helps keep track. I am looking forward to seeing what everyone does for NaBloPoMo. Thanks Jenny, Six Word Saturday is a fun quick post which I am going to try and keep up. Previous PostThrough The Lens Thursday #44. Play.